The 74HC/HCT7030 are high-speed Si-gate CMOS devices specified in compliance with JEDEC standard no. 7A. The 74HC/HCT7030 is an expandable, First-In First-Out (FIFO) memory organized as 64 words by 9 bits. A 33 MHz data-rate makes it ideal for high-speed applications. Even at high frequencies, the ICC dynamic is very low (fmax = 18 MHz; VCC = 5 V produces a dynamic ICC of 80 mA). If the device is not continuously operating at fmax, then ICC will decrease proportionally.With separate controls for shift-in (SI) and shift-out (SO), reading and writing operations are completely independent, allowing synchronous and asynchronous data transfers. Additional controls include a master-reset input (MR) and an output enable input (OE). Flags for data-in-ready (DIR) and data-out-ready (DOR) indicate the status of the device. Devices CAN be interconnected easily to expand word and bit dimensions. All output pins are directly opposite the corresponding input pins thus simplifying board layout in expanded applications. This is one package pinout of 74HCT7030,If you need more pinouts please download 74HCT7030's pdf datasheet. 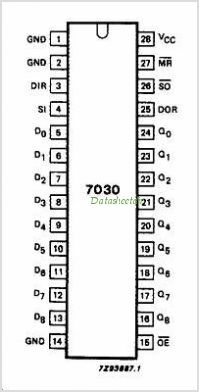 74HCT7030 circuits will be updated soon..., now you can download the pdf datasheet to check the circuits!